June 2016 Taurus Horoscope predicts that your emphasis should be on domestic issues and emotional stability as planetary strength has moved to the Southern sector of your horoscope towards the imum coeli. Your House of Family is dominant while your House of Career is weak. Career issues can be put on hold for the present and you can direct your energy to stabilize home affairs. Taurus, while your independence will be necessary sometimes, social networking will be necessary to accomplish your goals during other times in June 2016. Social activities will become more entertaining and pleasant during the month. You will be deeply involved in spiritual and religious activities along with your family members. Humanitarian causes will be of serious interest to you. Improving your proficiency and academic capabilities by learning and teaching subjects interesting to you will occupy the leisure time of the Taureans in June 2016. 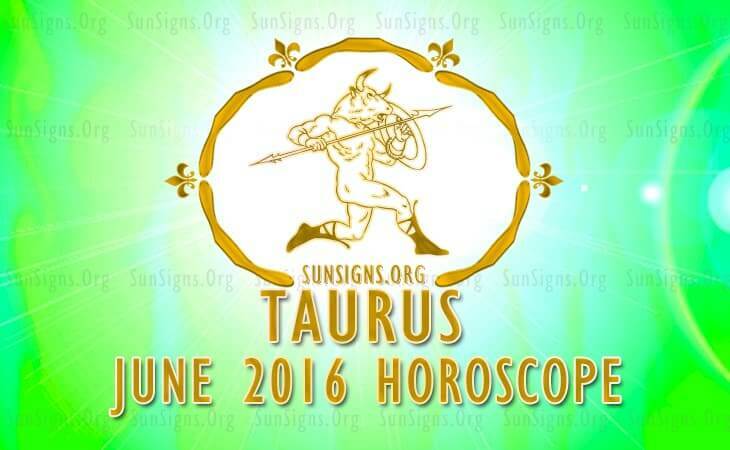 Career issues for the Taurus zodiac sign will require more patience to be rectified in 2016 June. You should spend your time to visualizing future business targets and the right methods to attain them. Single Taureans will have many exciting romantic opportunities in June 2016, but planets are not favorable for serious partnerships. People in serious relationships tend to be obstinate and there will be arguments and problems in the partnerships. Harmony can be achieved by conciliation as the month progresses. Planning for a child by the Bulls can be given a thought. Financial projects of your spouse will be profitable, but they require more effort. The Taurus 2016 June astrology forecasts suggest that the financial situation is exceptionally wonderful during the month. Dealings with realty will be highly profitable. You have the wholehearted support of friends and all the family members. You can afford to indulge in risky ventures and they will yield fabulous returns. You will find your client base in close circles and your neighborhood. The Bulls should pay attention to marketing and sales promotion with the help of media to boost your earnings in June 2016. Health will not pose any difficulties during June 2016 for the Taureans. Any changes to your fitness and diet regimes should be done by end of the month. Do not ignore peptic ulcers or ringworm infections. To conclude, the Taurus horoscope for June 2016 predicts that the month will be better spent putting your domestic affairs in order.